The set is a wing-tip needle with a metal cannula, plastic or rubber wings, and a plastic catheter or hub. The needle is 0.5 to 1.5 inches in length, with needle gauge sizes from 16 to 26. Infiltration is more common with these devices. The butterfly infusion set commonly is used in children and older clients, whose veins are likely to be small or fragile. 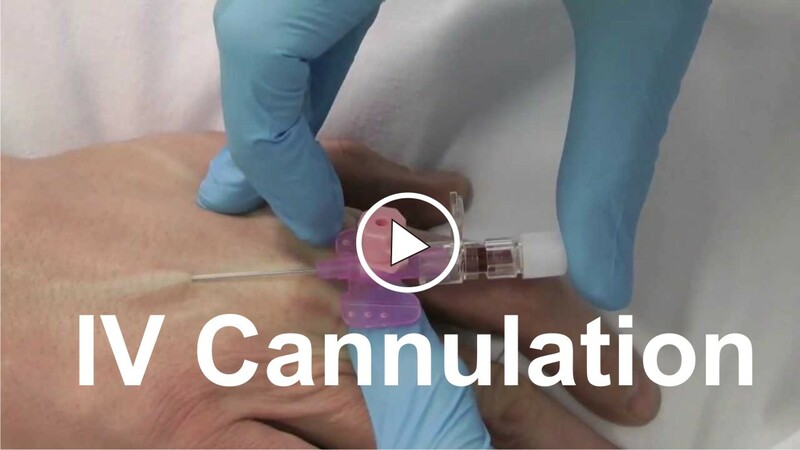 Watch Tips on how to Insert IV Cannula. Plastic cannulas may be an over-the-needle device or an in-needle catheter and are used primarily for short-term therapy. The over-the-needle device is preferred for rapid infusion and is more comfortable for the client. The in-needle catheter can cause catheter embolism if the tip of the cannula breaks. The gauge refers to the diameter of the lumen of the needle or cannula. The smaller the gauge number, the larger the diameter of the lumen; the larger the gauge number, the smaller the diameter of the lumen. The size of the gauge used depends on the solution to be administered and the diameter of the available vein. Large-diameter lumens (smaller gauge numbers) allow a higher fluid rate than smaller diameter lumens and allow the administration of higher concentrations of solutions. For rapid emergency fluid administration, blood products, or anesthetics, large-diameter lumen needles or cannulas are used, such as a 14-, 16-, 18-, or 19-gauge. 21-gauge lumen or cannula is used. For standard IV fluid and clear liquid IV medications, a 22- or 24-gauge lumen or cannula is used. If the client has very small veins, a 24- to 25- gauge lumen or cannula is used.